Technology is rapidly changing the call center, but that doesn’t mean traditional customer service is any less important. Call center representatives are still on the front line and can make or break the customer experience. While technology has stretched the conversation beyond the phone call and made customer service challenges more difficult, they also provide us with the tools for success. 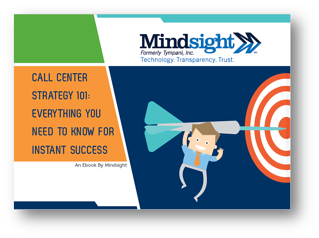 Download Mindsight’s FREE Ebook and learn the fundamental best practices of an effective call center. From social media to retaining and inspiring your workforce, Call Center Strategy 101 will provide any organization with the foundational elements that lead to a memorable customer experience in the 21st century. Fill out the form and get your copy of Call Center Strategy 101: Everything You Need to Know for Instant Success emailed to you within minutes!